Info:This Slammer features 'Bad Boy', and appears to have been produced by the World Flip Federation. 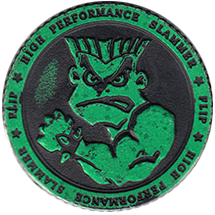 The same design (but with World Flip Federation branding) can be found as part of the World Flip Federation Gold Series Slammers. This is quite interesting as all the Bad Boy Club caps (and many similar style caps) have a blank back, so possibly they were produced by Plascot / The World Flip Federation. The slammer is made from black plastic and is printed with hologrpahic foil. Thanks to Killeru for the scan.